The reason why I decided to give this place a try was because my Mom told me to. No other reason, really. When Mom says go, I go, but it ended up making for a nice little Saturday morning. 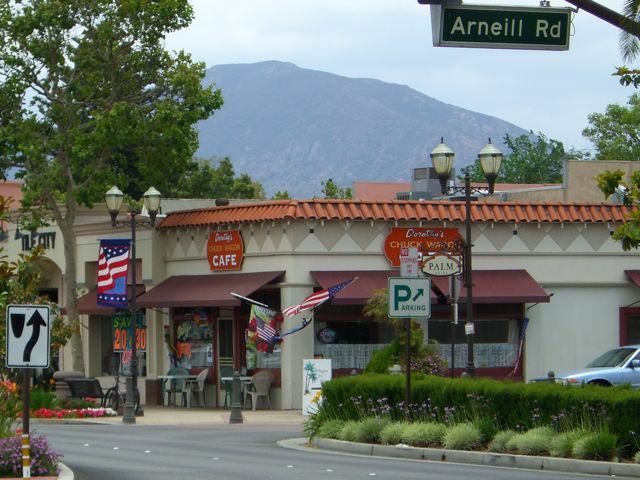 Camarillo is not a town that I spend a lot of time in, but I might make more trips out from now on. The town boasts a nice little farmer’s market every Saturday morning and it’s right down the street from Dorothy’s Chuck Wagon Cafe. 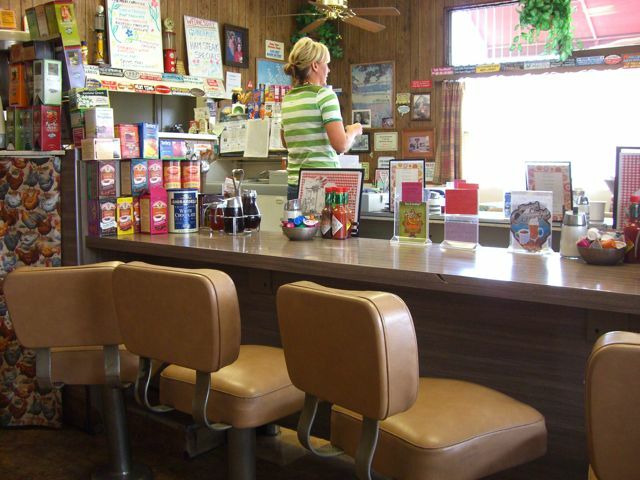 Dorothy’s has been owned by the same woman for over 25 years and her name really is Dorothy. I didn’t get the chance to meet her, but I did manage to get a good sample of the food on offer. This little place is known for having many different kinds of sausage, including buffalo and gator varieties. I started off with the special of the day, which was two eggs, chicken andouille sausage, home fries and a biscuit. The eggs were cooked well and the sausage had a surprising amount of spice to it. Not enough to call it hot, really, but definitely a little heat that sneaks up on you a after you’ve taken a bite or two. I was a little disappointed in the potatoes though. They were cooked well and were not too hard or too mushy, but they lacked seasoning and there were no bell peppers or onions present in the mix. On the other hand, the biscuit was hot, fluffy and enormous. It reminded me of the size that places typically reserve for cornbread. As I was eating my meal, I asked the waitress about another item on the menu. It was called an SOS. I had no idea what that was, so the waitress explained to me that it was an old acronym used in the navy. It means S*** on a shingle. 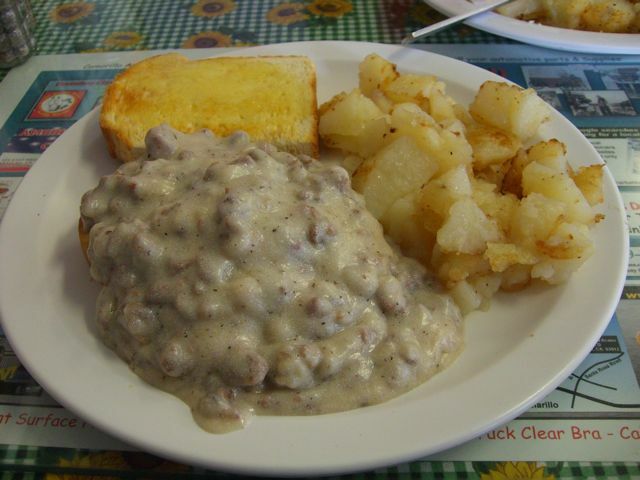 What it is, literally, is hamburger gravy piled high over toast. It was at this point that I let my curiosity get the best of me. I decided to order an SOS too. The SOS is not much to look at. In fact, I was slightly repulsed by it. Despite that fact, it was actually very good. It’s a lot of food and what you just looked at is only a half order. It was served with the same potatoes as before so I decided to pass them over. The bread underneath the gravy is a thick “texas toast.” It needed to be, because the gravy would have destroyed a lesser toast. There was what felt like a half pound of hamburger in the gravy too and I quickly understood why this type of meal was served in the navy. It’s quick, it’s cheap, it tastes good enough and it packs in the calories. Unfortunately, I do not need that many calories because I sit at a desk all day and so this marvel of culinary engineering was lost on me. I made it less than half way through the dish, not because I didn’t enjoy it, but because I was quickly filling up beyond the point of no return. Believe it or not, I actually ordered one other thing while I was at Dorothy’s. My mom had mentioned the sweet potato pancake, so I just had to give it a try. I’m glad she suggested it because it was probably the most interesting item of my visit. It was served piping hot and the butter, that sat atop it, melted away in the blink of an eye. These pancakes are more moist than their flour-y cousins, but still remain light and fluffy. I expected them to be really sweet, but they weren’t. The sweetness was actually very subtle and not overwhelming at all. I only managed to eat about two thirds of a hotcake, but if I’m ever back at Dorothy’s I think I’ll try them again before anything else. I want to say a quick thanks to my Mom, once again, for letting me know about this place. You gave me a reason to go out to Camarillo and I wouldn’t bet against me making a return trip in the near future. Maybe we can even go together. Dorothy’s is no frills. The servers are no-nonsense gals, who took a little while to warm up to me. When they did, though, they were very sweet. They took pride in their little cafe and took good care of me too. The prices were fair for the amount of food you get ($7-8 for a meal) and the small cafe puts out an old school vibe which I enjoyed very much. 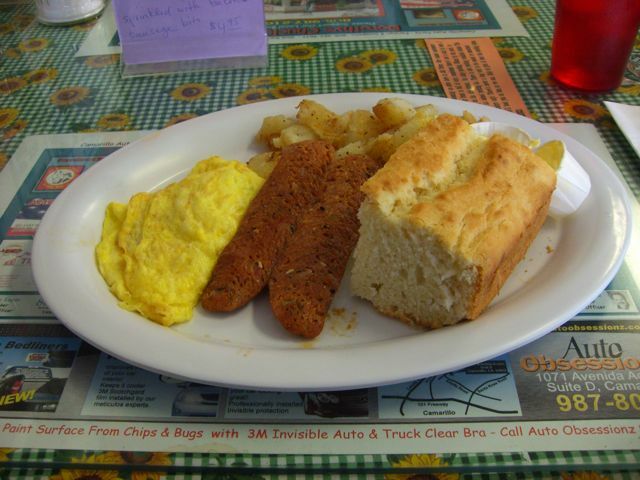 So if you find yourself looking for a good little breakfast before making your way over to the farmer’s market, give Dorothy’s a try. And make sure to let them know that the crazy guy, who ordered two and a half breakfasts, sent you. Dean and I stopped there with the kids a couple of years ago. We only had 2 at the time and we felt like sardines. I haven’t been tempted to go back simply because of the idea of squeezing 3 kids in. BUT I do remember the food was great. And hello?! Who doesn’t know what SOS is? Sometimes it is made with flakes of this lunch meat like stuff which is sliced very thin and tasteless. It’s all in the gravy though. SOS is a WT favorite in my parts!! The husband and I used to go there for breakfast. We haven’t been in ages because they get packed on the weekends and we usually go out at prime breakfast time. We loved the food, we just can’t stand waiting that long. I honestly don’t see any other reason why you would actually WANT to go to Camarillo. Glad I could give you the one. This place is GREAT. If you are lucky to live in Camarillo and can go to breakfast during the week ( no crowds) you can get a very reasonable price meal.You can smell the bacon cooking a block away.They always have some special going so have fun.A warning, if you order the large ham breaskfast you can feed the family.